In December 2017, details were released of the work underway on what will become the world’s tallest timber building. Mjøstårnet will be more than 80 m tall and stand nearly 30 m higher than the current tallest timber building – Tall Wood Residence in Vancouver (53 m). “Mjøstårnet sets new standards for timber constructions. The building is the closest we come to a skyscraper in timber,” said investor and contracting client, Arthur Buchardt. Mjøstårnet, named after its neighbour and Norway’s largest lake, Mjøsa. The record-breaking construction will sit on the edge of the north-eastern tip of the lake in the small town of Brumunddal, an hour and a half’s drive north of Oslo. Spanning more than 18 storeys, the building will include apartments, an indoor swimming pool, hotel, offices, restaurant and communal areas. Construction is scheduled to be completed in December 2018. 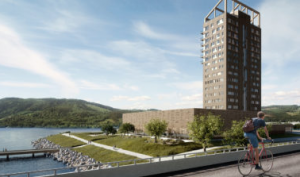 Moelven, a Mjøsa-local Scandinavian industrial group, will supply the timber constructions from local spruce forests required to construct the tower and the swimming pool area. “The assembly and construction of the Mjøstårnet is nothing short of world-class engineering, and will be managed without external scaffolding, despite the complexity of working at heights. We are primarily using cranes and supplementing with lifts as needed. We have reached 33 m to date, meaning we have 48 m to go”, says Buchardt. “A project group established by Norwegian roadauthorities investigated the possibility of building the world’s longest timber bridge across Lake Mjøsa. Their studies show that building with wood instead of concrete can reduce CO2 emissions by up to 30%”, says Buchardt.